The first church at Ashbury was built for the Abbot of Glastonbury sometime before AD 947 when it appears in the abbey chronicles. A number of the Somerset monks lived at Ashbury Manor which was a monastic grange. 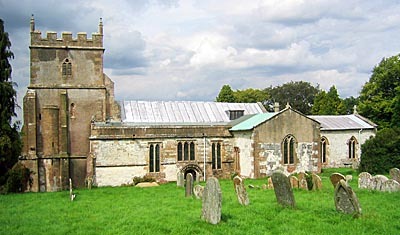 The earliest part of the present church is the 12th century west end. It was probably cruciform originally, with a central tower, but has been much altered over time. Most of the building is some three hundred years younger, though the chancel is 14th century and the tower and north and south chapels are 13th century. The porch is very large and has a priest's room over it. The South or Lady Chapel was originally as chantry and features the tomb of the founder. The North or Craven Chapel was fitted out in memory of Evelyn, Countess of Craven, who died in 1926. It is dedicated to the patron saint of hunting, St. Hubert, who is beautifully depicted in the window, since Ashdown House, in the parish, was always the favourite hunting lodge of the Earls of Craven. The chancel has a three ancient brasses set into the floor before the altar: to John de Walden (1360) and two former vicars in full priestly robes, Thomas Bushbury (1409) and William Skilton (1448). This was where the first Sunday School in the country was set up by Rev. Thomas Stock in 1777. He has a memorial on the north wall. © Nash Ford Publishing 2004. All Rights Reserved. The location of this church is now administered by Oxfordshire County Council.